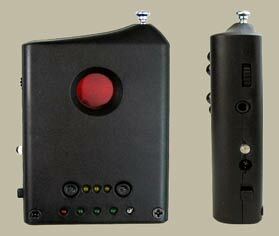 DSC-03 can detect wired and wireless pin hole cameras, spy wireless products. Besides, DSC-03 can detect RF frequency from 1MHz to 6.5 GHz (includes GSM. WIFI, Bluetooth, FM. VHF, UHF, 900/122/2400 wireless audio and video transmission frequency). Built in super bright LED can find out all hidden camera, pin hole camera, button camera and mobile camera, etc.